Thanks to its high brightness Field Emission source, the CAMECA SXFiveFE electron column offers experimental conditions that combine low accelerating voltages with intense beam currents. Under such optimized conditions, the interaction volume between the electrons and the specimen is reduced, and high spatial resolution can be achieved. X-ray maps were acquired on exsolution lamellae of clinopyroxene in orthopyroxene. The lamellae are only a few hundreds of nanometers wide. Both phases were analysed with a fully focused spot, demonstrating the high spatial resolution capabilities of the SXFiveFE. The X-ray maps acquired on Ca and on Mg illustrate the SXFiveFE's unique ability to combine low beam voltage for spatial resolution optimization with high sensitivity crystals for X-ray detection optimization. Quantitative analysis was then performed in both clinopyroxene and orthopyroxene phases using a focused electron beam of 8keV and 20nA. 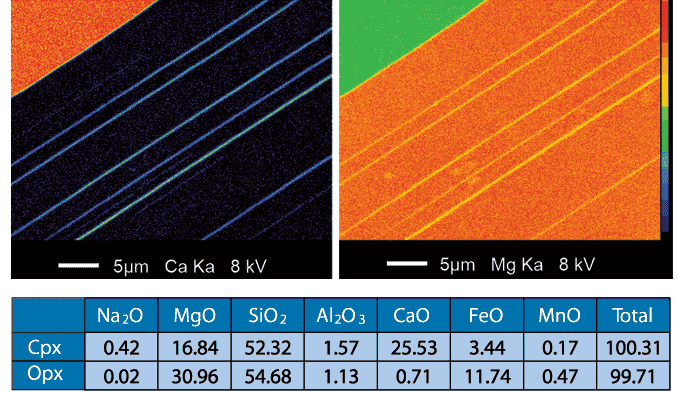 The datasets below demonstrate the superior capabilities of the SXFiveFE to determine accurate quantitative elemental composition. ©2017 CAMECA. All rights reserved.